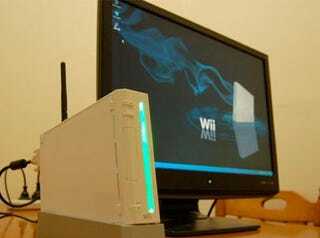 Do this, and you'll never have to complain about your Wii having no games to play ever again. Course, you'll also have voided your warranty. Actually, you'll have voided your entire Wii, since it's now nothing but a case for a loud VERY LOUD PC, but hey, some people will go to great lengths to make a point about the Wii and its supposedly limited uses. Pic of the guts (and the loud vid) after the jump if you're keen.